Last month we started laying some groundwork by explaining carbon 14 dating. We saw that it works well for determining the time of death of something that died within the last few thousand years. Because the half-life is 5,730 years, essentially all the carbon 14 will decay in about 50,000 years. This means it can’t possibly be used for dates older than that. Furthermore, correlation with other dating methods is poor for dates more than a few thousand years ago. This is either due to the inaccuracy of the other methods, or differing amounts of carbon 14 in the atmosphere a few thousand years ago, or both. Evolutionists generally don’t use carbon 14 dating because they believe most rocks of interest were formed millions of years ago, and were never alive. So, they like to use other radioactive materials that decay much more slowly. They prefer elements that have half-lives that are measured in millions or billions of years. You don’t have to think very long to realize that there are certain practical problems with measuring the half-life of an element that takes a long time to decay. Suppose an isotope has a half-life of 5 million years. Theoretically you could start off with a pound of it and see how long it takes for a half pound to decay. Practically speaking, we don’t have the patience or longevity to do that experiment. Fortunately, there is another way. Last month we told you that the equation for exponential decay is Ae-t/T. We also said that just about everything that decays is described by this same equation. All that differs is the value of T, the “time constant”. There are lots of unstable radioactive elements that decay in just a few days. Scientists do have the patience to study them, and they all decay exponentially. So, it is entirely reasonable to assume that all radioactive decay is exponential, regardless of the time constant. The trick, as we said, is to figure out a way to measure T quickly when T is very long. If you have taken at least one semester of calculus, you know that the derivative of Ae-t/T with respect to time is (-A/T)*(e-t/T). You also know that e0 is 1. So, the value of (-A/T)*(e-t/T) right now (when t = 0) is simply -A/T. If you don’t know any calculus, you can be thankful that I am not going to explain it to you. Just take my word for it. The derivative tells you how fast something is changing. In our case, it tells us how fast the amount of a radioactive isotope is changing. The minus sign means that there is less of it as time goes on. The value A is the amount we have right now, which we can easily measure. So, if we know how fast the isotope is decaying, we can solve Decay rate = -A/T to find T.
How do we know how fast it is decaying? Well, every time the isotope decays, it emits some sort of radiation. Therefore, we can use a Geiger counter, or some other similar instrument, to count the number of atoms that are decaying per second. Since the experiment is easily done, and quite repeatable, we know with a high degree of confidence what the half-lives of long-lived radioactive elements are. What’s the problem with using long-lived radioactive elements to measure long time spans? It is basically the same problem we had with carbon 14. We know how much of the parent and daughter products we have now, but we don’t know how much was there to begin with, so we don’t really know how much has decayed. Often, the amount of stable daughter element is used to estimate the amount of original radioactive mother element there was. Remember in the May newsletter we printed the e-mail from Tim, who stated quite confidently that “naturally occurring” Lead 206 makes up 24.1% of all the Lead in a sample. Therefore, he says, “the excess above 24% tells me [Tim] how much U-238 there was.” As we pointed out last June, there isn’t any way to really know how much Lead 206 was there to begin with. The date calculation is no more accurate than the initial guess of how much Lead 206 was in the rock when it was formed. It is sometimes claimed that the isochron method can determine the initial amount of daughter element, but that method depends upon an invalid assumption that we will discuss later. Why Shouldn’t Fresh Lava be Old? Rob, a visitor to our web site, sent us an e-mail that posed this excellent question about the potassium-argon (abbreviated K-Ar because K is the chemical symbol for potassium) method commonly used to date volcanic rock. I am a student studying evolution, and I noticed your website. … My real comment to you regards your statement about Mount St. Helens. You state that "radioactive measurements of these rocks show them to be millions of years old" And why shouldn't they be? Even though you say that they were produced in days or hours, have you not considered where this stratified rock is from? It is from deep inside a volcano, and it doesn't surprise me that the rock, lava, whatever, is millions of years old. Please think this over and explain what you mean. In other words, evolutionists assume that since argon is a gas, all of it should have escaped from the lava before it cooled. Therefore, all the 40Ar in the rock should be the result of decay from potassium. Based on the measured potassium, argon, and the decay rate, they calculate an age. That’s why it doesn’t matter how long the magma was in the volcano before it erupted. They believe that when the volcano erupts, all the 40Ar escapes, and the atomic clock gets reset to 0. If all the argon escaped from hot lava of volcanoes that erupted long ago, then all the argon should escape from the hot lava of volcanoes that erupt in modern times, too. But modern lava does have 40Ar in it. This is known as the “excess argon problem” in geological circles. It is our position that there is no such thing as excess argon. The rocks have the right amount of argon in them. This amount just happens to be more than the amount predicted by an incorrect theory. So, in our opinion, the main problem with radioactive dating is knowing the initial concentrations of the radioactive elements. The fact that water would have ample opportunity to add or remove water-soluble chemical elements if the rocks really were millions of years old, is irrelevant if you don’t know how much was there to being with. So, let's focus on how one could figure out the initial concentrations, and what assumptions one would have to make to do that. The most highly touted method is the “isochron” method. This is basically a graphic method, so we need to take time for a short tutorial on how to extract information from a graph. For the purpose of this illustration, we will use some fictional data. Imagine that we work for the highway department and have collected some data on various segments of roads. We have measured the average speed of vehicles traveling on each section of road, and the number of fatal accidents per year per vehicle on that section of road. Furthermore, suppose that we plot this data and get the graph at the left. In this graph there is no correlation between speed and traffic accidents. This could be because some of the road segments had sharp, blind turns. Perhaps some segments were high in the mountains and got lots of snow or black ice on them. On the other hand, let’s image that the highway data turned out to look like this. This graph tells us that there is a correlation between speed and fatal accidents. The most accidents happen on those segments of road where people drive the fastest. This suggests a cause-and-effect relationship. The graph, all by itself, does not tell us which is the cause and which is the effect. Different people might draw different conclusions about the cause and the effect. One scientist might conclude that driving fast causes more traffic accidents. Another scientist might conclude that drivers know which sections of road are most deadly, so they drive very fast on them to spend as little time in the danger zone as possible. Clearly, the first explanation is more reasonable, but we can’t determine that from the graph alone. We know the first explanation is more reasonable from other data that does not come from the graph. The graph merely shows us that speed and accidents are somehow related. Sometimes things might be correlated because of a cause-and-effect relationship, but the cause might not be one of the variables plotted. Suppose that the second fictitious graph represented salary at age 30 and high school SAT scores. Certainly future salary cannot be the cause of high SAT scores. The cause must always occur before the effect. We know that intuitively, not from the graph. It might be that high SAT scores result in higher salaries. That is at least plausible, and might even be the correct explanation. It is entirely possible that test scores and salaries are both effects of a third cause that isn’t even on the graph. It may be that good schools and good teachers produce pupils who score well on tests and get good jobs. The true cause may be the educational system (or social factors, or economic factors, etc.). The graph cannot tell us that. Unlike the previous fictitious examples, this is real data. It shows the composition of rock samples taken from two mountains in southern Quebec, published in a modern geology textbook 3. This graph shows an undeniable correlation. 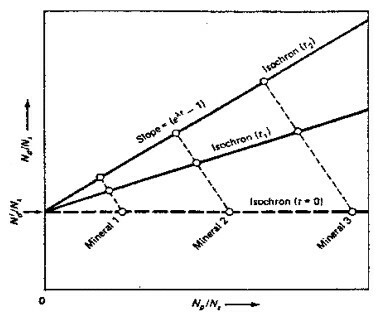 It is typical of graphs of this kind of geologic data. One might conclude that whatever process created the elements in the rock, created different amounts of mother and daughter elements. Furthermore, when that process created more of the mother element, it also created more of the daughter element. The graph does not tell us what that process is. It could be that when stars explode they create different amounts of the various elements, and, for some reason, create more of the daughter when they create more of the mother. Or, it could be that when an intelligent designer creates rock, that designer has some reason (which we have not discerned) for creating more mother element and more daughter element in some cases. All the graph does is show a definite correlation. The graph itself does not give us any kind of clue as to what process caused the correlation. Let’s look more closely at the graph. The X axis represents the ratio of 87Rb to 86Sr. The Y axis represents the ratio of 87Sr to 86Sr. The X and Y values are both divided by 86Sr simply because it is easier to measure ratios than absolute numbers of atoms. The 86Sr is merely a scale factor of convenience that normalizes the data. Note also that the Y axis is distorted. Instead of going from 0.0 to 0.8, it goes from 0.702 to 0.726. If one plotted the graph with the origin at (0,0) instead of (0, 0.702), the line would have been almost horizontal. This isn’t really unethical, because it would be very difficult to see any trend if plotted on a scale from 0.0 to 0.8. We aren’t criticizing them for choosing the axis scale as they did. We just want to make sure that you realize that although there were large differences in 87Rb to 86Sr ratios (plotted on the X axis), there really wasn’t very much difference in the 87Sr to 86Sr ratios (plotted on the Y axis). How do evolutionists get age out of this data? We will let the geology text explain. Let’s review the assumptions evolutionists make. Third, they assume that the rocks are old enough that 87Rb had time to decay. If the rocks are 10,000 years old, then only 0.00002% of the 87Rb has decayed. That isn’t enough to measure accurately. But, if the rocks are 127 million years old, then 0.1802% has decayed. That might still be tough to measure, but at least it is feasible. So, as time goes on, the ratio of 87Rb to 86Sr decreases because some of the 87Rb is decaying. At the same time, the 87Sr to 86Sr ratio is increasing because 87Sr is being produced by the decay of 87Rb. This will cause the sample points to move to the left and up on the graph. What the text doesn’t tell you is that they don’t move very far. For example, one of the Mount Megantic points appears to be at (5.000000, 0.714000) now. That point would have been (5.009000, 0.712713) if the measurement had been made 127 million years ago. We believe that whatever process creates rock, creates it with large variations in 87Rb to 86Sr. We believe that because the data in the textbook shows that it can vary from 0.2 to 11 in Quebec. There may be other places in which the ratio is even more diverse. Apparently whatever process creates rock, creates it with relatively small variations in 87Sr to 86Sr. The textbook shows that in southern Quebec, the ratio is always about 0.71. Apparently, for whatever reason, when the process creates a lot more 87Rb in the rock, it also creates just a tiny bit more 87Sr. We don’t know why the ratio of 87Rb to 86Sr varies so much. Evolutionists don’t know either. The textbook author speculates that it is because rocks assimilate various amounts of crustal rock when they are formed; but he doesn’t know that for a fact. Nor does he know why the rocks would assimilate various amounts of crustal rock. It is just a guess he makes to try to explain the data. But if there is more 87Rb in crustal rock, and if the crustal rock has been around for 4.5 billion years, then that 87Rb had time to put a little more 87Sr in the crustal rock. So, those rock samples that have more 87Rb should have had more 87Sr when they formed, invalidating their assumption that the 87Sr/86Sr ratio was the same regardless of the amount of 87Rb when the rocks formed. The table below summarizes data found on pages 120 - 126 of Grand Canyon, Monument to Catastrophe (Cr) by Dr. Steven Austin. He collected data from various sources on the ages of three different kinds of Grand Canyon rocks. These sources included Arizona Bureau of Geology and Mineral Technology Bulletins, Geological Society of America Bulletins, a report titled “Compilation of Radiometric Age Determinations in Arizona”, a U.S. Atomic Energy Commission Annual Report, as well as his own research. The table contains data on three difference rock formations in the Grand Canyon. dr. Austin has computed the isochron ages using data from the model ages next to them. The Uinkaret Plateau samples came from lava flows on the plateau at the top of the Grand Canyon. Some of these lava flows actually flow down into the canyon, so the eruption must have occurred after the canyon was formed. This lava is some of the youngest rock in the Grand Canyon. 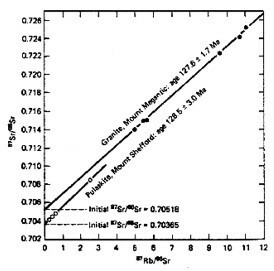 The radiometric ages for this formation go from 10,000 years (the 0.01 K-Ar date in the upper left section of the table) to 2.81 billion years (the Pb-Pb isochron date). Rubidium-strontium dates all agree that the rocks are about 1.3 billion years old, which would make them pre-Cambrian rocks, not modern Quaternary rocks (which they obviously are). The Cardenas Basalts are late pre-Cambrian rocks. Evolutionists believe they are more than 600 million years old. So, they believe 700 million to 1 billion years is a reasonable age. But which isochron age should you believe? That would depend on whether or not you find pre-Cambrian fossils in them. If you believe the fossils you find are 700 million years old, then the K-Ar date is right. If you believe the fossils are more than 1 billion years old, then Rb-Sr gives the correct date. The Diabase Sills are some of the deepest, and therefore oldest, rocks in Grand Canyon. But they yield some of the youngest Rb-Sr dates. They have the oldest K-Ar isochron dates, but those dates aren’t nearly old enough. They should be several billion years old (according to evolutionists). If radiometric methods were accurate, it would not matter which method you use. They would all give the same answer; or they would say that the age is outside their valid operating range. In other words, carbon 14 dates of coal should always turn out “more than 50,000 years” and other radiometric methods should say recent volcanic eruptions are “less than 10,000 years.” You should never have the case where one rock is dated 2.3 million years, 1.3 billion years, or 2.5 billion years, depending upon the dating method used. The table shows that is exactly what happens for Uinkaret Plateau rocks.